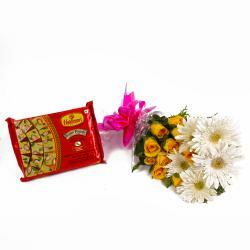 Product Consists: Bouquet of 10 Purple Orchids with green fillers along with Box of Kaju Katli Sweets (Weight : 500 Gms). 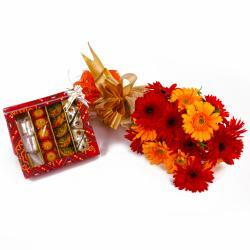 Together, this is a sweet token of your affection which will convey your feelings to your loved one with enthusiasm. 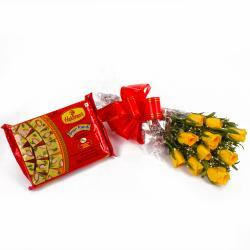 Birthday, Anniversary, Congratulations, Karwa Chauth, Republic Day or any other occasions, such cherished event can be made even more memorable with this gift. It comes with a bunch of ten purple orchids, the bouquet is tied with a matching ribbon bow, lending it an even fancier look along with it you will get kaju katli sweet. So go ahead and book your order now. Thus send this hamper and bewilder your loving Indian counterpart along with other Gifts to India through Giftacrossindia.com. This gift hamper contains : Bouquet of 10 Purple Orchids with green fillers along with Box of Kaju Katli Sweets (Weight : 500 Gms).